$15 entry fee for kids ages 3-17. (Children 2 years of age and under are free.) Adult admission (anyone over 18) is $5 which does not include attractions. 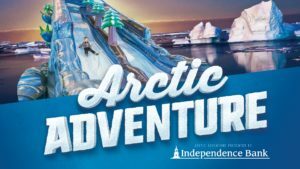 The second annual Owensboro Parent Arctic Adventure Kids Fun Festival presented by Independence Bank will be Friday, December 30 and Saturday, December 31, 2016! This indoor polar playground will be full of activities for kids of all ages! Frostbite Fred and his crew learned a lot from last year’s expedition, so this year’s Arctic Adventure is going to be even more exciting. Attractions include Snowzilla (30 ft tall inflatable slide), SnowMazing (inflatable maze), Everest Climb n’ Slide (inflatable ice castle and double-sided slide), Igloo Obstacle Course, Avalanche Cliff Jump (inflatable free-fall), King of the Mountain, a Mechanical Snowboard, Snowball Pit, Independence Bank’s “Arctic Express” Train Ride, and more. All Arctic Adventure activities are included in the $15 entry fee for kids ages 3-17. (Children 2 years of age and under are free.) Adult admission (anyone over 18) is $5 which does not include attractions. As a special bonus, the Owensboro Parks and Recreation Department is giving a FREE general admission skate pass for ice skating at the Edge Ice Center to each Arctic Adventure ticket holder. Each session lasts 90 minutes and is limited to 400 paid admissions to ensure shorter lines for maximum fun. For more information and to watch the video from last year visit www.arcticadventurefun.com.